Kiprop previously competed in competitive clothed runs. Kiprop previously participated in competitive clothed runs. WESTWOOD—In what commentators are describing as a “fantastic return to form”, former Olympic gold medalist Asbel Kiprop stunned the crowd tonight with a record-breaking performance in UCLA’s 12th annual Undie Run. Skipping under Spaulding field and through Wilson plaza with ease, the Kenya native and World Championship-winning middle distance runner recorded a time of 3:57.21 minutes, far surpassing the 4:41.67 set by a drunk Nick Symmonds in 2011. Spectators stood in awe in and around De Neve Plaza as he arrived. Kiprop also recorded the fastest 8 clap of the night, with a time of 3.41 seconds. Rounding out the medalists for this quarter were 3nd year Molly Villa, 1st year Bryan Tan, and Caster Semenya of South Africa with the times 4:52.34, 4:55.29 and 5:00.87, respectively. For each, it was their first time participating in the competition. What has many talking however, more than the feat itself, is the context in which it happened. Most famous for having won gold in the 1500m in Beijing at the age of 18, Kiprop turned to undie running in 2012 after becoming disillusioned by a poor performance in London. According to his coach, what was initially a temporary outlet for his talents, however, quickly turned to a passion for him. 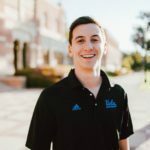 He has since participated in dozens of undie runs over the past several years, in American universities such as Arizona State, the University of Florida, as well as in international competitions. When questioned about his strategies, the Olympian states that he tries to avoid taking selfies while running and most of all, pregaming before invitationals. “Not many people realize this, but I pregamed a little at London before my heat. Never making that mistake again,” said Kiprop. Kiprop’s coach says that he hopes to take the momentum of this win going into Melbourne Undie Invitational this July, where he will compete against half-naked and nearly-naked track stars from across the globe. In light of his return to form, Hanes are said to have reignited interest in sponsoring the 24-year-old as well, revealing plans for a line of Kiprop-themed “runner’s whiteys”.